Over 20 years ago Arcam produced the Back Box standalone digital-to-analogue convertor. This was one of the first (for obvious reasons, the claim to exactly who was first is hotly contested) devices that could bypass the output of an existing CD player via an S/PDIF digital output and convert it to an analogue signal via a higher-quality output stage than the CD player had internally. Consequently, the Black Box was highly regarded and sold well. During the late 1990s, research into jitter and a change in philosophy saw the DAC fall out of favour and Arcam's output at this time was comprised entirely of one-box CD players. Now that a DAC renaissance is in full force, the company has returned to a keenly contested market with the rDAC. As the sub-£1,000 DAC market is looking rather busy these days, it's good to see that the rDAC is far more than a 'me too' product. Central to its performance is the new Wolfson Microelectronics WM8741 chip. This is the successor to the WM8740, which has been central to some very strong CD offerings from Arcam, as well as Cambridge Audio and Rega. Boasting improved signal-to-noise measurements and detail changes to filtering, the WM8741 gives the rDAC some very strong credentials. Arcam has made use of an ongoing relationship with high-end digital manufacturer dCS, a company that has contributed to some of its star performers over the years. This time, the relationship has gifted the rDAC, the patented dCS Asynchronous USB Technology system. This is a relatively new take on USB transfer and allows for increased performance from this increasingly common connection. Given that a great many rDACS are likely to find themselves being connected via USB over anything else, this is good thinking on the part of Arcam. Later on in this year, the final part of the rDAC's arsenal will become available in the form of wireless transmission. Arcam says that this will involve more technology from dCS and a wireless dongle. The transmission will handle everything up to lossless files and will open up another way of extracting audio from a computer, as well as making a great deal of sense if the rDAC is already connected into a particular computer via the USB input and you wish to use another computer 'on the fly'. As it is, the wireless input light sits on the front of the rDAC, but cannot currently be selected. The wireless version will be £100 more than the version tested here. As well as the USB and forthcoming wireless, the rDAC sports a relatively conventional optical and coaxial digital input and a single RCA phono output. If you need more than one of each particular input, or are interested in a balanced XLR output, you will need to look elsewhere, but the Arcam's specification on the whole is competitive for its asking price when the Asynchronous USB input is taken into account. The unit itself is small, but pleasant to look at and use and is styled as part of the Solo range – although it doesn't look so different from other Arcam separates to be visually at odds if placed with them. The chassis is all-metal and feels solid and well constructed. Input selection is via a single button on the top of the unit. The input light glows red and then switches to green when a connection is established, which is a nice touch if you should need to fault-find a connection. Another sign of impressive attention to detail is the USB connection. Connect the rDAC to a PC and it will display on the PC as an 'Arcam rDAC, rather than a generic USB component that so many of its key competitors will do. Connection itself is fast and effective and our sample unit connected quickly and simply to a variety of PCs and Macs during the test period. Sonically, the rDAC is a strong proposition. 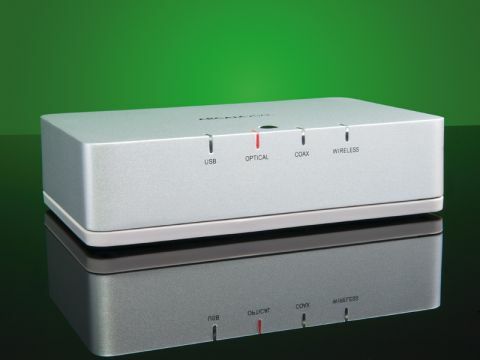 Connected over USB and given lossless or better files (although 24-bit/192khz files are limited to a transmission rate of 24/96), the rDAC is an enticing performer. It produces a natural and unforced presentation, entirely free from harshness or aggression. Indeed, its performance is free from even the slightest sense of digital sheen or artefacts, which is a huge boost to long-term listening. Given that this naturalness is an intended outcome of the design of the Wolfson WM8741, it is good news to report that this appears to have succeeded in practice. Vocals are well presented and believably real with the sense of space and decay vital for the suspension of disbelief. The rDAC will also present an excellent and well-judged soundstage, well in proportion to the recording being listened to. Further good news is that switching to compressed music, be it the 320k MP3 of Spotify or music ripped to lossy AAC in iTunes stays involving and listenable. The rDAC is quick to reward the use of high-resolution files, but pleasingly slow to punish the use of compressed ones. Switching over to the coaxial input does not change the behaviour of the rDAC in any substantial way, although this is as much a reflection of how good the USB input actually is, rather than any deficiency on the part of the coaxial input. The rDAC always remains natural and unforced and even poor recordings will not push it towards stridency or harshness. Give the rDAC a typical modern recording with the levels turned Spinal Tap-style to eleven and it will manage to find the dynamics within it that have been compressed to within an inch of their life. This gets even better when you give it a CD recording which has been treated with a little more respect and the results are very nearly as good as high-resolution digital over USB. The only real downside of this control and relaxed nature is that given a genuinely exciting recording, there is a sense that the rDAC is keeping some of the dynamics and force in check. This is often apparent in the bass response which is fast and tuneful, but not as deep as some of the Arcam's key competitors. Those who need more excitement in their lives and are possibly willing to trade off a little of the Arcam's extremely forgiving nature with poor recordings, may be better served elsewhere. Alternatively, this is nothing some thoughtful system matching would not solve. The rDAC marks a welcome return to an increasingly important product category from one of the original pioneers in the field. Just as importantly, the wait has also been worthwhile. The arrival of well thought out and well-implemented Asynchronous USB at this price point is a welcome shake up to the market. That the rDAC has this and regular connections running through a desirable new DAC chip in a well-built box is even more welcome. If you are in the process of going 'post CD' in your current system, then the rDAC is a must-audition product. It is able to achieve excellent results with computer audio and the lack of fuss or hassle – making it work with a variety of computers – bodes well for widespread compatibility. Back in the realms of conventional hi-fi , the rDAC faces stiff competition from the large selection of very accomplished performers over more conventional digital connections, which means that it deserves a place on a slightly longer shortlist, but it certainly deserves a place nonetheless. There has never been a better time, given the market trends, to be looking at the rDAC as an inexpensive boost to your digital replay.